Zürich, SwitzerlandUsain Bolt’s 19.66 meeting record in the 200m and Mohammed Aman’s dramatic upset victory over David Rudisha were just a pair of the highlights at the Weltklasse Zurich on Thursday, the first of two Samsung Diamond League finals for 2012. 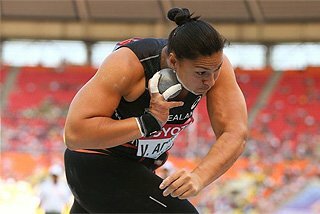 In all 15 series-long Samsung Diamond Race trophies, and the USD 40,000 prize that accompanies them, were awarded – the men’s and women’s Shot Put winners were crowned yesterday – before another sell-out crowd of 26,000 who packed Letzigrund Stadium despite steady rains and unseasonably cool temperatures. By the time Bolt was adjusting his blocks for the 200m, the rains had finally relented but the temperatures had dipped to a chilly 14 C. The cold didn’t seem to affect the double Olympic champion, or his compatriot Nickel Ashmeade, who pushed, and even threatened Bolt for some 160 metres of the contest. The pair was relatively even off the curve and into the stretch until Bolt finally pulled away for good to beat the 19.79 meeting record set by Wallace Spearmon two years ago. 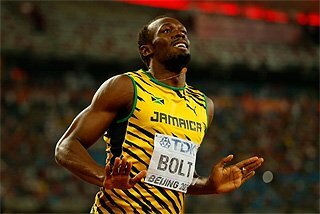 "I’m happy to run another sub-20, but I didn’t want to push my body," said Bolt, who will conclude his season in Brussels next Friday. "It’s the end of the season and you have to be careful." Ashmeade’s 19.85 personal best rewarded him with the overall Diamond Race victory, his 15 points beating Bolt’s 12, while further back in the more immediate race, Jason Young (20.08) and Warren Weir (20.18) completed a 1-4 sweep for Jamaica. In the men’s 800m, Rudisha suffered a shock defeat at the hands of a familiar face: Aman, the Ethiopian teenager who ended the Kenyan’s win streak at 26 just under one year ago. Then, running in similarly rainy conditions in Milan, Aman beat the recently-minted World champion by 0.07. Here Aman’s margin over the freshly-minted Olympic champion was four times as large courtesy of a 1:42.53 national record. When he crossed the line, the collective shock expressed by the crowd was palpable. Rudisha was out strong as expected, trailing his pacesetter Sammy Tangui by about two strides through the first 400 metres, covered in 49.59. That was a full second shy of the pre-race plan, and one sensed that Rudisha was in trouble when Aman ate up much of the margin by the 600-metre (1:16.24) mark. The two entered the straight nearly even, beginning an epic stride-for-stride battle until Aman, this year’s World indoor champion, pulled ahead midway through the straight. "I am incredibly thankful to win in front of this audience with a new PB and national record," said Aman, whose previous best of 1:42.20 came in the Olympic final where he finished sixth. "It was a difficult race but I was in good shape." With his victory here, Aman also lifted the Diamond Race Trophy, tallying 14 points to Rudisha’s 12. The World record holder was gracious in defeat. "The race was fast," Rudisha said, giving Aman his due. 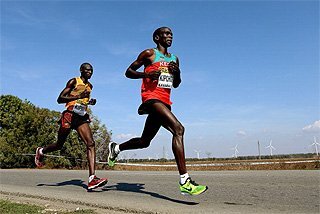 But, the Kenyan added, "My legs felt tired and I cannot run good if the weather is not good. I hoped for a faster race and am a little bit disappointed." Discounting a pre-season race back in March, Rudisha’s 1:42.81 was his second slowest performance of the year. Well back Leonard Kirwa Kosencha was third, just ahead of American Duane Solomon (1:44.29 to 1:44.42). As illustrated by Bolt’s stellar run in the 200m, the cool conditions did little to slow the action on the straightaways. Midway through their latest 100m showdown, Shelly-Ann Fraser-Pryce decided to make it a lop-sided affair, and a fast one at that. Shifting gears at about the 60-metre point, the Jamaican pulled away to a quick 10.83 victory, a hefty 0.14 clear of her American rival to capture the Samsung Diamond Race in the short sprint. "We are very competitive whenever we race each other," said Fraser-Pryce, whose run in the Zürich chill was her sixth this season at 10.90 or better. Considering that some pre-race problems with her calf which almost forced her to the sidelines, not a bad performance. "This is my last race (of the season) and I really wanted to do well." Fraser-Pryce ended Jeter’s two-year reign as Diamond Race winner, 19 points to the American’s 13. 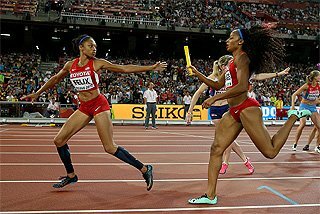 For her part, Jeter, who clocked 10.97, managed to hold off a quick-finishing Allyson Felix, who clocked 11.02. 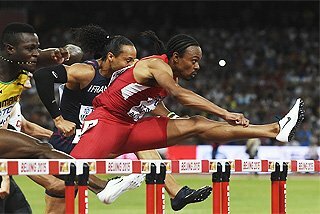 In the men’s 100m, not on the Diamond Race schedule this week, the victory went to Bolt’s training partner Yohan Blake, who carried himself confidently to the line in 9.76. "I’m not surprised that after the Olympics I’m coming out so strong and so fast," said the double Olympic silver medallist Blake, who knocked 0.01 from the meet record set by Asafa Powell in 2006. "Next year I can even be better." Nesta Carter was a distant second in 9.95, with Ryan Bailey of the U.S. third in 10.97. Tyson Gay never reached the finish line after being disqualified for a false start. Later, Gay and Bailey teamed with Darvis Patton and Wallace Spearmon in the Zürich Trophy 4x100m Relay, winning in 38.02, 0.17 ahead of Jamaican quartet Mario Forsythe, Young, Weir and Kemar Bailey Cole. It was always a long shot for Sanya Richards-Ross to win the 400m Diamond Race, but the Olympic champion did end her season with a convincing victory over Amantle Montsho, 50.21 to 50.33, pulling away over the final five strides. Montsho’s runner-up finish gave her 20 series points in all, four ahead of Richards-Ross. 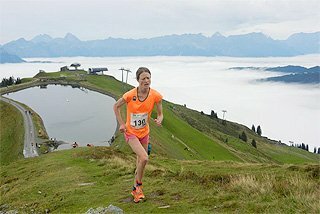 For the American, it was her sixth victory in Zürich. Jamaican Rosemarie Whyte was third in 50.41. Given the rain and chill, the men’s 400m Hurdles was a fairly quick affair, with Angelo Taylor the winner in 48.29. The American was out fast, carrying a small but clear lead into the final bend, with Felix Sanchez and Javier Culson, the Olympic gold and silver medallists, less than a metre behind. Entering the straight however it was Jehue Gordon of Trinidad & Tobago and Cuban Omar Cisneros who looked strongest, narrowing Taylor’s gap and looking ready to pounce. Taylor managed to fend them of, with Cisneros finishing second in 48.34, 0.06 ahead of Gordon. Sanchez, celebrating his 35th birthday, looked good midway through the final straight, but later faded to fourth (48.52). 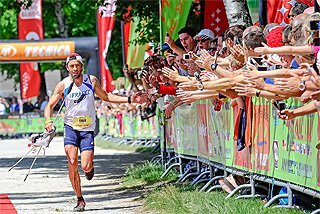 Culson was even further back finishing fifth in 48.56, but brought an insurmountable series lead to Zurich. After powering away to another victory here, Dawn Harper continues to impress in the sprint hurdles. Carrying a clear lead by the third barrier, the Olympic silver medallist pulled away to clock 12.59, well ahead of compatriots Queen Harrison (12.68) and Kellie Wells (12.69). Her victory doubled her Diamond Trophy point tally to 16, four ahead of Olympic bronze medallist Wells. "I am so excited!" said Harper, who improved to 12.37 this season. "This will be great motivation for next year." The evening’s longer events on the track weren’t short on drama, with one, the women’s 3000m Steeplechase, even providing some important lessons to would-be winner Sofia Assefa. Running confidently down the homestretch, the 24-year-old Ethiopian was well on her way to a 9:21.32 victory and meet record, and a triumph in the Diamond Trophy Race. 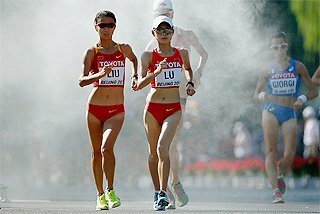 But her celebration was short-lived after her disqualification for running inside the cones on the last lap approach to the water jump, an error that cost her US$ 40,000. In her stead, compatriot Etenesh Diro Neda took the win in 9:24.97, nearly two seconds ahead of another Ethiopian, Hiwot Ayalew (9:26.99). Although she finished well down in ninth after suffering a fall over a hurdle, Milcah Chemos lifted the Diamond Trophy for the third straight year with 12 points. 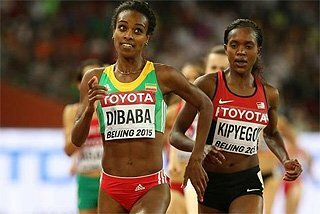 There was no stopping Abebe Aregawi in the 1500m as the young Ethiopian ended her breakout season with a Diamond Race victory in the event. At the tail end of a tactical contest, she was the picture of calm and cool when she crossed the line in 4:05.29, more than a second clear of Kenyan Mercy Cherono (4:06.42). The 22-year-old collected 21 points in the Diamond Race to finish well ahead of Olympic bronze medallist Maryam Yusuf Jamal (4:11.05), who was never in the hunt here and finished a well-beaten 11th. The Diamond Race in the men’s 5000m was largely up for grabs, and Isiah Koech took full advantage. The 18-year-old, who finished fifth in the Olympics, out-dashed better experienced rivals to take the victory in 12:58.98 and clinch the series title with 17 points. 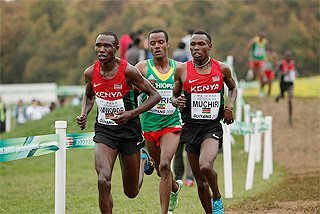 Thomas Longosiwa, 13 years his senior, was second in 12:59.24 while Bernard Lagat, who was fourth in London and at 37 more than twice Koech’s age, finished third, his 12:59.92 a season’s best. Hagos Gebrhiwet, the pre-meet series leader and this year’s second fastest man, was a late scratch. The conditions most heavily impacted action on the infield, although some good competition, and even a few notable performances, shined through. One example was Yelena Sokolova’s victory in the Long Jump with a 6.92m leap, a solid jump given the cold conditions by evening’s end. Her win also gave her 22 total points to take the Diamond Race. Nigerian Blessing Okagbare was second at 6.85m with Briton Shara Proctor (6.80m) third. 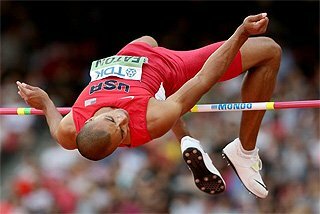 In the men’s High Jump, which began in the early evening’s long steady rain, Olympic champion Ivan Ukhov dealt best, managing third attempt clearances at 2.28m and 2.31m to take the victory. The Diamond Race went to Briton Robbie Grabarz who was second at 2.28m, tallying 17 points to outdistance World champion Jesse Williams, who topped out at 2.25m to finish fourth with 12 points total. In the Javelin Throw, former World champion Tero Pitkamaki made it two Samsung Diamond League victories in a row courtesy of an 85.27m final round throw to defeat compatriot Antti Ruuskanen who reached 83.36m in round four. Czech Vitezslav Vesely was fourth with an 80.54m best, boosting his season-long tally to 14 and victory in the Diamond Race. In terms of the Diamond Trophy chase, there was little suspense in the first three events on the rainy programme with Olympic champions Sandra Perkovic, Renaud Lavillenie and Christian Taylor having clinched the series titles in the women’s Discus Throw, Pole Vault and Triple Jump, respectively, before their arrival in Zurich. Two of the three underscored their season-long dominance with victories here as well. Throwing in a steady early evening rain, Perkovic won for the sixth time in Samsung Diamond League competition this season, her winning toss of 63.97m coming in the first round. "It was important for me to win today because I only lost once (in the Samsung Diamond League)," said the 22-year-old Croatian, who also reached 63.73m and 63.91m in rounds four and five to eventually win by more than a metre from Yarelis Barrios. "It was difficult to win because of the weather and rain, but still, I was the best today." 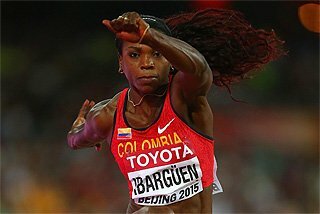 Barrios threw 61.73m in the final round to move from fifth to second, and also elevated her to second in the overall rankings after lifting the Diamond Trophy in both 2010 and 2011. Pole Zaneta Glanc was third here with 61.31m, with Stephanie Brown-Trafton of the U.S., fourth at 60.99m. Things went more easily for Lavillenie who needed just two jumps – first attempt successes at 5.55m and 5.70m - to win his third successive Diamond Race Trophy. "Yes, today was very wet," said Lavillenie, who nonetheless ended the competition with three soggy attempts at 5.80m. German Bjorn Otto, the Olympic silver medallist, beat Czech Jan Kudlicka and Briton Steve Lewis on countback at 5.55m to finish second in the competition and in the season-long standings. Things didn’t quite go to script in the Triple Jump where Italy’s Fabrizio Donato joined the clouds to rain on Taylor’s series victory parade. In second behind the reigning World and Olympic champion through round five, Donato reached 17.29m with his final leap to finish 13 centimetres better than the American, whose 17.16m came in round four. "It was hard to jump far in this rain and to jump so often, but I got better and better with every jump," said the Italian veteran, who took bronze behind Taylor in London. No one else managed to beat the conditions and breach the 17-metre line; Frenchman Benjamin Compaore was closest with 16.96m, finishing third.